Peel and slice the shallot, garlic and carrot. Cut the celery into 2cm chunks. Place these ingredients into a wide, shallow saucepan with the herbs, water and white wine vinegar. Bring to the boil. When boiling, remove from the heat and submerge the salmon steaks into the stock. Leave for 10 minutes to poach gently. Pick the leaves from the dill and roughly chop. Finely slice the spring onions. Clarify the butter and add the dill to the butter. Cut the French stick into slices on the angle and drizzle with olive oil. Bake the bread in the oven for 10 minutes until golden around the edges and crisp. 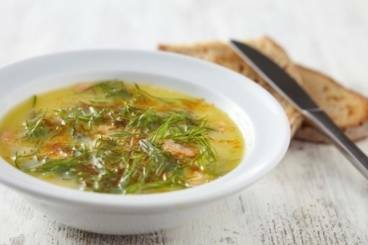 After 10 minutes, remove the salmon from the poaching liquid with a slotted spoon and place on kitchen paper to absorb any stock. Flake the salmon with your fingers (it should still be pink in the middle) and mix in the brown shrimps, spring onions, salt and cayenne. Stir in 2/3 of the butter. Add a squeeze of lemon juice and check the seasoning. Spoon the mixture into ramekins, smooth the top with a pallet knife and cover each ramekin with the remaining butter. Place in the fridge for at least 30 minutes for the butter to set. To serve: dress the rocket leaves with a drizzle of olive oil and a squeeze of lemon. Place a neat pile of rocket leaves on a small plate, place the ramekin alongside and finish with the crunchy olive oil bread.